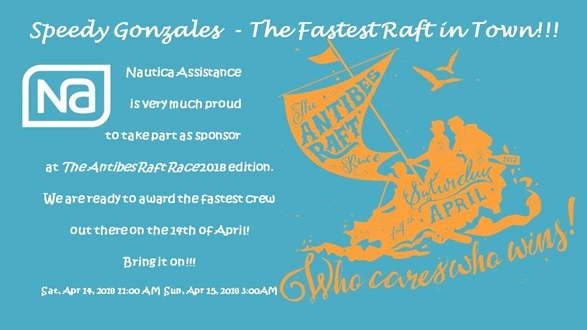 Nautica Assistance is happy to share its participation to The Antibes Raft Race in 2018. We are proud to reward the fastest crew with the very coveted 'Speedy Gonzales - The Fastest Raft in Town' award! This fantastic fund raising event will take place in Antibes on Saturday 14th of April and will help two chosen charities this year: The Antibes Lifeboat, which is manned by unpaid volunteers who urgently need donations so they can continue to save lives; Restos du Coeur who help those in need including the elderly and the homeless to enjoy hot nutritious meals. It will be also a great opportunity to share time together with so many known friends in the amazing scenario of Port Vauban.